John Wesley Gilbert, a minister in the Colored Methodist Episcopal Church (CMEC) and professor at Paine College, accompanied Bishop Walter Russell Lambuth on his exploration trip to establish a Methodist Episcopal Church, South (MECS), mission in the Congo. 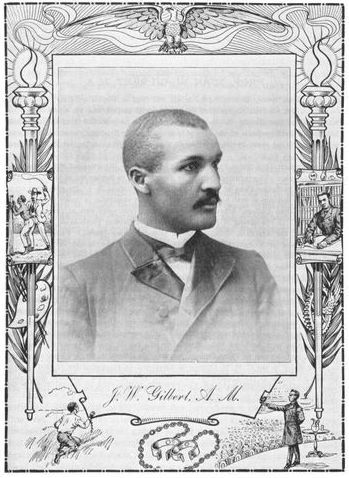 Both in 1865, Gilbert, who held B.A., M.A., and D.D., was the “first” student, first graduate, and first African American member of the faculty of Paine College founded in 1882. A graduate of both Paine College in Augusta, Georgia, and Brown University in Providence, Rhode Island, Gilbert won a scholarship to study Greek at the American School of Classics in Athens, Greece. A gifted linguist and very able classical scholar, Gilbert was appointed chair of Greek and Modem Languages at Paine College in 1903. Though he had repeatedly had more lucrative offers, Gilbert had taught in or been connected with Paine College until his death in 1923. He saw in Paine College his best opportunity to aid in the uplift of African Americans and he continued his work there for one more year prior to his taking up his duties in his new field of the African Mission. Gilbert and Lambuth prepared carefully for the mission they were about to undertake. Before leaving the United States, Gilbert had sought out William A. Sheppard, a black minister from Virginia, who began the American Presbyterian Congo Mission, to learn from him all he could about the work in the Congo. After arriving in the Congo, they traveled by small river trading boats on the Congo, the Kasai, and the Lulua Rivers for nearly nine hundred miles to Luebo, the headquarters of the Southern Presbyterian Mission. It was at Luebo that the Congolese gave African names to their American guests. Gilbert received the name of Mutombo Katshi. On February 1, 1912, Lambuth and Gilbert reached Ewangu, the village of Chief Wembo-Nyatna and received an enthusiastic welcome. One of the members of the caravan, Mudimbi, had been a boyhood friend of the chief, and while they had not met for many years, they immediately recognized each other. It was largely through the influence of Mudimbi, who was an evangelist in the Presbyterian Church at Luebo, that Chief Wembo-Nyama received the southern Methodists so cordially. After consulting with his headmen, Chief Wembo-Nyama declared his entire kingdom open to the Methodist mission and invited Lambuth and Gilbert to establish a station in his own capital. Having obtained Wembo-Nyama’s consent to open a mission in Central Congo, Lambuth applied for a concession to the Colonial Office in Brussels in March 1912. Lambuth said that Gilbert had been very helpful in securing the concession of a site for the mission. Gilbert had written letters to the Belgian authorities and the work was so well done that the Colonial Minister inquired who wrote the letters and remarked that they were the most correct and elegantly expressed among those received at his office from one who was not a native of either France or Belgium. A grant of twenty-two acres of land was subsequently secured from the Belgian government. Lambuth and Gilbert returned to the United States on March 13, 1912, to seek recruits to begin work. The first group of missionaries included Daniel L. Mumpower, a physician, and his wife, a registered nurse, both of Missouri; Charles C. Bush, preacher, and his wife, a teacher, both from West Virginia; and Mr. and Mrs. John Stockwell, from Louisiana. On his second visit to Africa, Bishop Lambuth officially inaugurated the first Methodist Mission in Central Congo on February 12, 1914. Chief Wembo-Nyama and all the members of his council attended the opening ceremony. When Dr. John Wesley Gilbert died in 1923, and despite Bishop Lamouth’s efforts to maintain a close cooperation between black and white church leaders, no black person was sent to Central Congo as missionary. Inspired undoubtedly by the southern Presbyterians who had a fifty-fifty plan of black and white missionaries, Lambuth had proposed in 1913 that both black and white missionaries be sent to the Congo Mission. Some influential southern Methodist officials refused to go along with the idea, however. In February 1935, the Belgian government informed the American Missionary Societies that black missionaries would no longer be welcomed to the Congo. Consequently, no African American missionary had served in Central Congo Conference before the independence of the Congo on June 30, 1960. Nevertheless, it was an African-American, John Wesley Gilbert, who was one of the pioneers in this important mission work. Adapted from Michael O. Kasongo, “A Spirit of Cooperation in Mission: Professor John Wesley Gilbert and Bishop Walter Russell Lambuth,” Methodist History 36:4 (July 1998): 260-265.